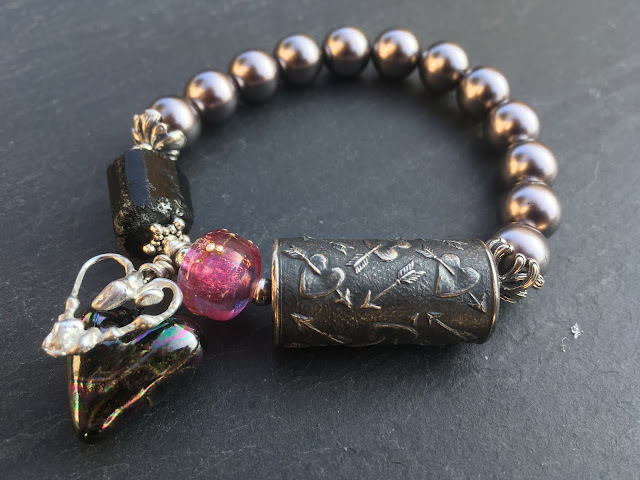 To me, creating jewelry with art beads is like composing a piece of music. You start with an idea of the main melody and the story you want your piece to tell, the feeling you want to elicit in the audience. Then you flesh it out with other colors and shapes as harmonious accompanimens. Two of my favorite "melody" artists at the moment are Anne Choi and Cathleen Zaring. Anne Choi's handmade sterling beads each tell their own story, either with a brief line of poetry or miniature illustration. 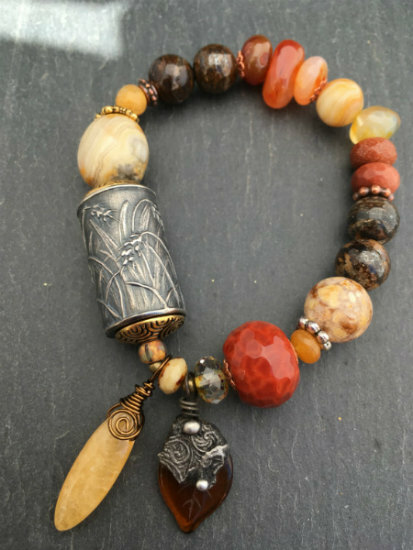 This first pic is Anne Choi's Wheat bead, combined with a soldered leaf charm by Sasha Crow that ties together the rustic fall gemstones and Harvest feel. 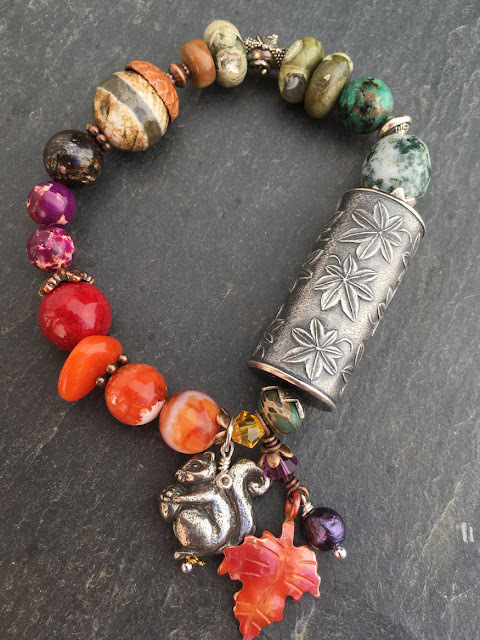 The next is another Anne Choi, her Maple Leaf bead, combined with Green Girl Studio's pewter squirrel and a copper leaf by Patricia Healey with a rainbow assortment of gemstones to represent the array of colors in the changing seasons. I recently created one with a special Valentine's Day theme, that my heart really went into. It's a hug to everyone who has ever hurt on Valentine's Day, and a reminder to be Single and Fabulous! It features Anne Choi, Susan Woodworth, Jolene Riley and Cheryl Kiyoi. Another source of wonderful inspiration (and catalyst for my shameless hoarding) is Cathleen Zaring who works in copper enameling. Each piece with its shape, colors and decorations, is its own tiny vignette. I especially enjoy her pieces that have holes in the bottom, offering great opportunity to add bits and treasures to flesh out the story. 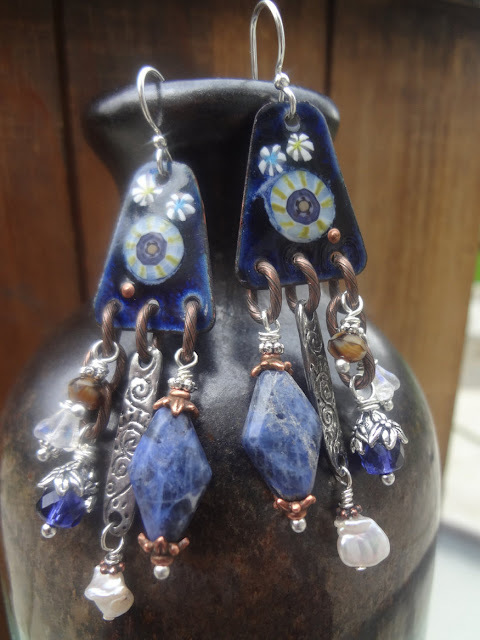 The first one of these "Treasure Earrings" I made combined denim blue and copper Cathleen Zaring pieces with Green Girl Studio's decorative link with "Strength" inscribed on it, combined with Sodalite and copper chain. 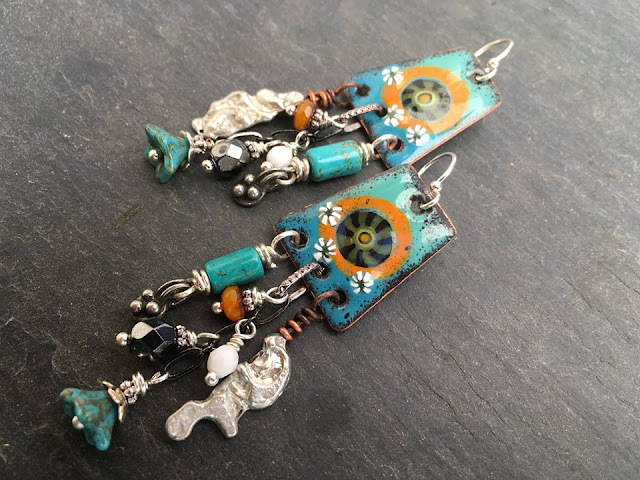 The next pair uses soldered Splash headpins by Susan Woodworth that give an element of oceany movement and glimmer and complete the story of an underwater garden full of little treasures. 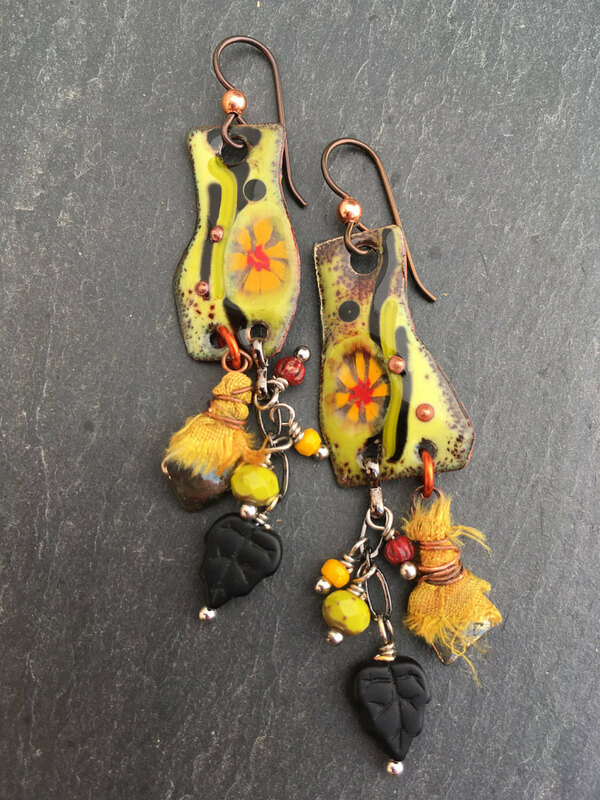 The last pair uses offbeat edgy mismatched charms by Cathleen Zaring in bold spicy colors. These were perfectly complemented by handmade Sari silk and Pyrite drops made by Anna Pierson, with their own bit of random shape and striking colors. To see more of Monica's colorful art bead jewelry visit her Etsy shop, Feminine Genius Jewelry and her Facebook page. Such beautiful designs Monica! You've got a great design sense. What beautiful eye candy! Thank you for sharing. Great post - I loved seeing all of your beautiful creations! Thanks for sharing the artists you used. I love the analogy of composing music and making jewelry! Beautiful work! Love your compositions and the message each piece sends---wonderful!!! Nicely done, Monica! I've loved looking at your jewelry--so imaginative and well crafted. Congratulations on your headlining in this article! !